Sinopsis : Tsutsui Hikari is an otaku, and he mostly avoids social life. Hikari has only one friend at school, who is also a social misfit, and he is mocked brutally by most of his classmates for being creepy and weird. One day, he ends up having to clean the school pool with Igarashi Iroha, who appears to be pretty much everything he hates in real-life girls. She skips school, has a blunt manner, doesn't have female friends, and seems the sort to be promiscuous. However, she is friendly to Hikari, and even stands up to the people who make fun of him. Hikari's bitterness and trust issues lead him to say pretty harsh things to Iroha, but she never dismisses him as creepy. 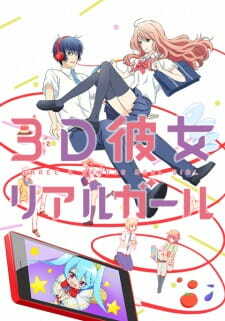 After a while, it starts to look like Iroha may become his first real-life, 3D girlfriend! Will he be able to handle it?